In the past couple of years (and seemingly intensifying over the summer), the labor market in Carbondale has become very tight. 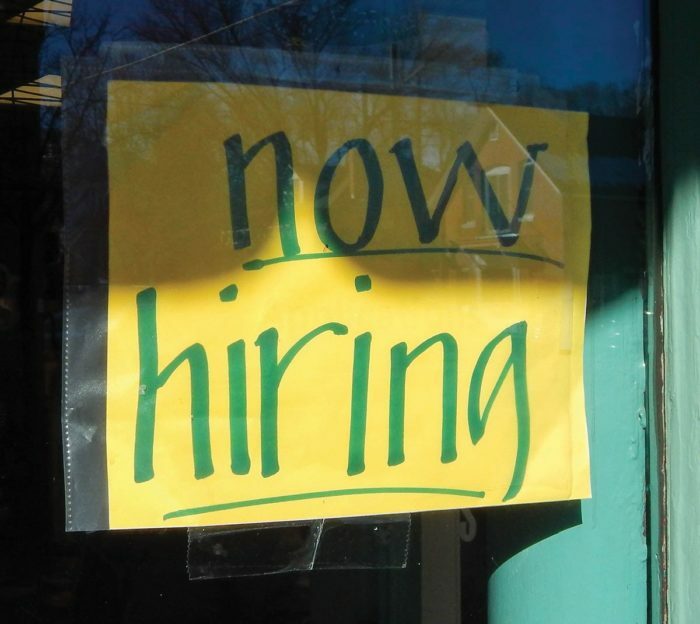 The numerous “help wanted” signs posted in windows around town are perhaps the most visible symbol of employers’ struggle to attract — and retain — high quality employees in the Roaring Fork Valley. The statistics affirm this trend. According to the Colorado Workforce Center in Glenwood Springs, a natural unemployment rate is about four percent. Garfield County’s current unemployment rate is 2.9 percent. A number of factors including a tricky resort-affected economy, an affordable housing crisis, a strong national economy, and shifting demographics help explain why local businesses are trying out a number of new strategies to attract reliable, satisfied employees. Peña laments that many potential employees are being priced out of the Carbondale housing market and are relocating downvalley. That means he has to compete with Glenwood Springs businesses to incentivize employees to commute to Carbondale. He has raised his starting wage by $1.50, and touts perks such as free tastings, fun and educational excursions to distilleries and breweries, and a huge employee discount on products as selling points to attract workers. Even so, he continues to struggle to fill positions. In addition to the commuting issue, new restaurants opening in town — likely a reflection of a strong tourist economy — are further tapping an already limited labor pool of servers, cooks, bartenders, and dishwashers, he said. Attracting specialized applicants with college degrees for white collar positions is proving no less difficult. Gavin Dahl, General Manager of KDNK, has been struggling to fill a news director position that commands a salary in the $40k range. When he was hired into that position several years ago he struggled to find available housing. “I was sleeping in guest rooms, pet sitting, camping at the KOA and driving back to Denver on weekends. I didn’t find a rental for six weeks,” he said. Casting a national web for candidates is difficult because many are unfamiliar and turned off by the sparse, expensive housing options, if any can be found at all. Though he says KDNK has garnered interest for the position, “I’m very worried that as we try to fill this position, strong candidates won’t be able to relocate,” he said. He applauds the efforts of counties to provide affordable housing but wants to see more. The Workforce Center in Glenwood Springs in on the front lines of the challenging labor market. Dawn Bray-Jenks, the Assistant Director there, said there are 204 jobs in Garfield County, and 138 in Pitkin, that need to be filled, and these are only jobs that are registered through the organization’s online system. She said the Workforce is striving diligently to connect the right employees to local businesses. “For both job seekers and employers, we’re an incredible resource. We have a broad gambit of jobs we’re looking to fill. We do hiring events, provide workforce information and education to our businesses. Our goal is to give employers as much support as we can and work with them for their future needs as well,” she said. The Carbondale Chamber of Commerce is also tackling the labor market challenges. “We’ve noticed a shift away from the traditional employee benefits,” said the Chamber’s Executive Director, Andrea Stewart. “Some examples include flexible schedules rather than traditional office hours, increase in pay rather than a retirement plan, as well as recreation and health and wellness stipends,” she said. She said businesses are thinking more creatively about how to make the relocation process as smooth as possible, and Carbondale is looking to help them do that. While relief may be on the horizon, it could take several years for the balance between supply and demand in the labor market to harmoniously equalize. Issues like affordable housing and an increasing reliance on a commuting workforce do not seem likely to dissipate. The high cost of living is unlikely to subside as the Roaring Fork Valley continues to earn its place as an international resort destination. It may be two years or more before the Hispanic workforce feels safe to apply for certain jobs. Carbondale businesses will continue to have to be creative and persistent to build a reliable workforce. In the end, the quality of life offered by the Roaring Fork Valley may be its saving grace. “We hope the opportunity to live and play in paradise will offset the downsides of the high cost of living,” said Gavin Dahl.